As the summer wanes, I look about the yard and wish I'd had the energy to follow through with the weeding plans. Part of that is the sheer workload we've had this year. It's been unrelenting in amount. I come home so tired that the recliner with a cat in my lap is all I want to do. And there was a vacation and then an illness. So the overgrowth hasn't quite reached jungle proportions, but it's a lot this year. And then I find this. 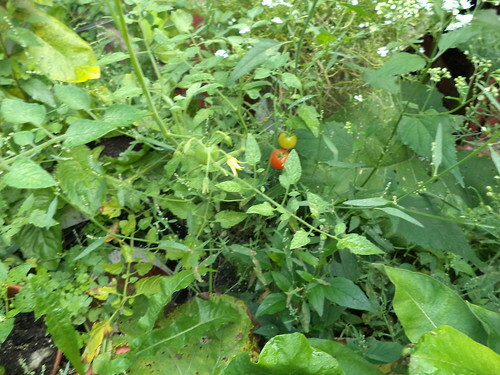 It's a volunteer cherry tomato plant. 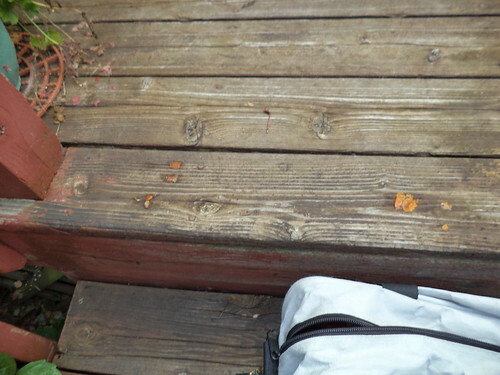 I didn't pay a whole lot of attention to it because it's off to the side of the deck. Last week, I noticed the red fruits on the plant. I cannot remember the last time I planted tomatoes. I love tomato soup and use sauce and paste in cooking but I'm not fond of tomatoes off the vine. I don't remember why we had cherry tomatoes other than to try to grow them. So I have no estimation of the age of the seed that sprouted. When I gardened extensively, volunteer anything wasn't an uncommon occurrence. This was quite the surprise. I had not decided what to do with the ripe fruits and someone decided for me. I left for work one morning at the end of last week and found this on the deck. The ripened fruits were gone. I'm inclined to think the masked bandits of an earlier post had a midnight snack.